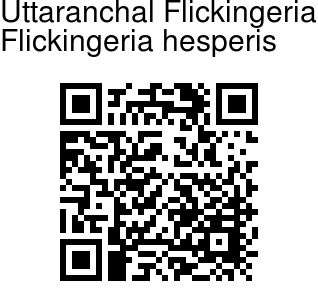 Uttaranchal Flickingeria is an epiphytic orchid endmic to Utaranchal, 1-2 ft tall. Leaves are up to 11 cm long, stalkless. They are minutely bilobulate, mid-vein terminating in a short flat-obtuse mucro in sinus. Flowers small, white, occuring singly in leaf axil or at leaf base. Sepals are cream-colourd with dark brown spots on the outside, triangular, pointed. 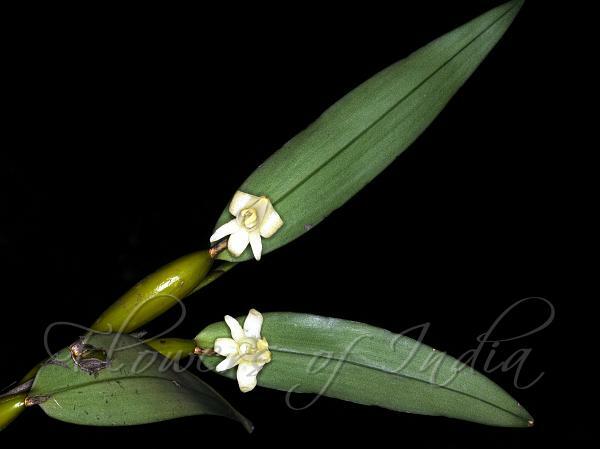 Petals are as long as the dorsal sepals, white linear- lanceshaped. Lip is 3-lobed, cream-colored, margins almost entire. Hypochile (underpart of the lip) has large side lobes, is triangular in out line, without any color spots, keels 3, yellow.